Developer: AA Rosenbaum Services Ltd.
iBless Food is a handy, on-the-go guide to the Hebrew blessings recited before and after eating. 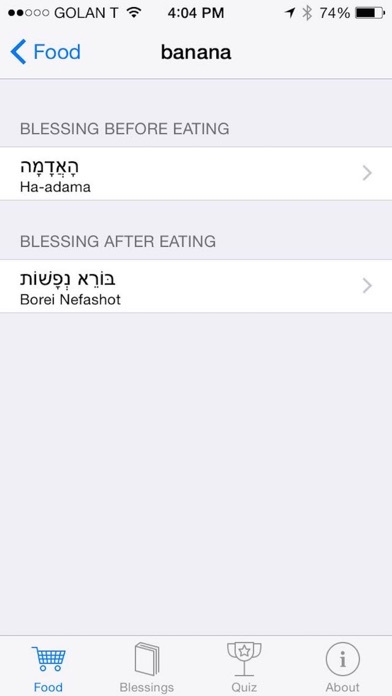 * Instantly look up the correct blessings for hundreds of different foods * View, hear, and learn the blessings recited before and after eating, including Birkat Ha-Mazon, the Grace after Meals * Test your knowledge of the blessings with a quick quiz! B"H This is a great app for beginners and experienced benchers alike. It has a very helpful explanation of what brachas to make before and after. 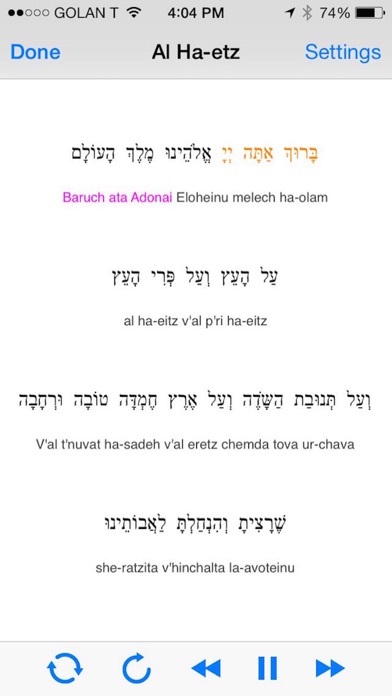 The song along feature has helped me to learn the birkat hamazon. Excellent app. I use it daily. The concept is good. The app works well. I've just been running into dead ends. 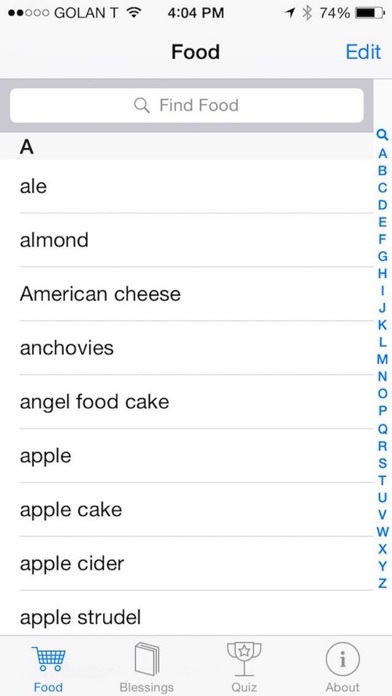 I got this app specifically for those food items I'm not sure about on the go. I thought this would replace the brachot book I have. I still find the book superior. If this app increased it's database and added a "learn more" feature to explain certain topics (like why bananas are ha'adama) regarding the food item chosen then it would be a five star app. Also the conditions for Brachot, like if the food is considered a meal or not, could be better outlined. This is a great app. When my wife makes a new food I dont even have to ask what brocha, I just pull out my ipod and find outright away!!!!!!!!!!!!!!!! KEEP UP THE GREAT WORK!!!! Just needs English with the pronunciation and it would be perfect. It would be very helpful to also have the English translation of each prayer, so one could understand what one is saying, and to be able to learn the differences (in English) among the various types of food blessings. It would also be helful to learn WHY a particular food belongs in a certain category (for example, why the blessing for tomato is ha-adama, when it grows on a vine, and why the blessing for grapes is ha-etz, when it clearly grows on vines). Great. Does both the jobs I need. I can double check the blessing on any food that I (or my family) may be unsure. Also gives my kids a chance to play a useful and educational game. Keep it up! 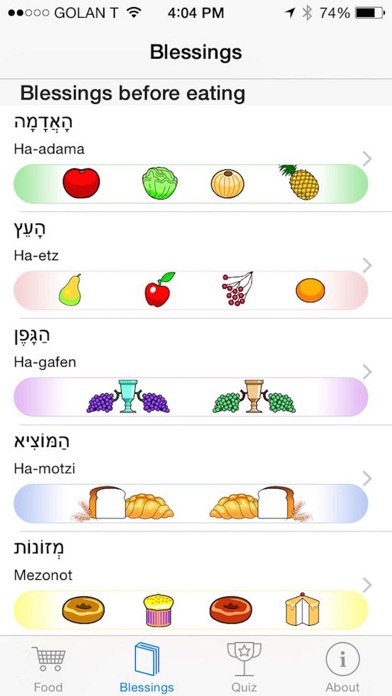 For me personally - I don't think I will come across and food on a typical day and not know its Bracha/Blessing (quite a limited group of foods :) ) - but I think the quiz mode is great - to get kids and adults to learn the Brachot - We already had a family quiz night on the I-touch So if you need help figuring out Brachot and or you want to have really cool "Ipod Brachot Flash Cards" I think it is a great prodcut. More by AA Rosenbaum Services Ltd.